Yesterday we talked about American Gods, or our heroic apotheosized figures, as well as Great Ones, or ancestral figures who we haven't yet raised to mythic levels. We noted that America also has legendary, perhaps divine figures aside from our heroes and ancestors. The ones we passed over yesterday were male figures who are important to the legendary identity that forms the American self image, but we also have other figures, who are perhaps more nebulous, and definitely more female, who form a pantheon of somewhat loftier magical figures, these are our American Goddesses. Two of the three about whom I'm going to speak are pretty commonly known, and most Americans even recognize that they are essentially Goddesses, although we often assume they are Goddesses of some earlier religion rather than Goddesses within the construct of our National identity. The third is less familiar but more wholly American as she is the divine persona of our country itself. These three Goddesses are those most associated with American ideals and are also those who would be associated with shaping our National course and the manifestation of the virtues and values we associate with our Nation. In regards to Liberty and Justice they also rule over very practical concerns for our daily lives, as well as practical concerns regarding how we direct our momentum as a culture. Columbia represents the ideal of America and the American dream as a whole, and at times she is herself associated with Liberty, but is more essentially the goddess of what it is that is America and Americanism. Liberty appears as Libertas amongst the Romans. A temple was erected to her on the Aventine during the second Punic War, and she was placed on the estate of Cicero once he was subdued by the forces of Augustus. So Liberty as a Goddess reaches back into antiquity and has remained a force of power and inspiration across the world, with numerous depictions in the United States, as well as depictions abroad as Freedom and Democracy. She was further depicted on Roman coins, which could be obtained as offerings or talismans in her honor. This would function easily as an invocation to this Goddess or a prayer to be made in her honor, especially with its tie to one of the most important contemporary symbols of her, especially within the consciousness of our Nation. The poem was originally penned as part of fundraising efforts for building the statue and therefore functioned on some level as an invocation calling forth the physical presence itself making its use as an invocation to this goddess even more appropriate. Liberty appears on several coins and state and National icons and therefore has a fixed tie to our National and State government institutions. 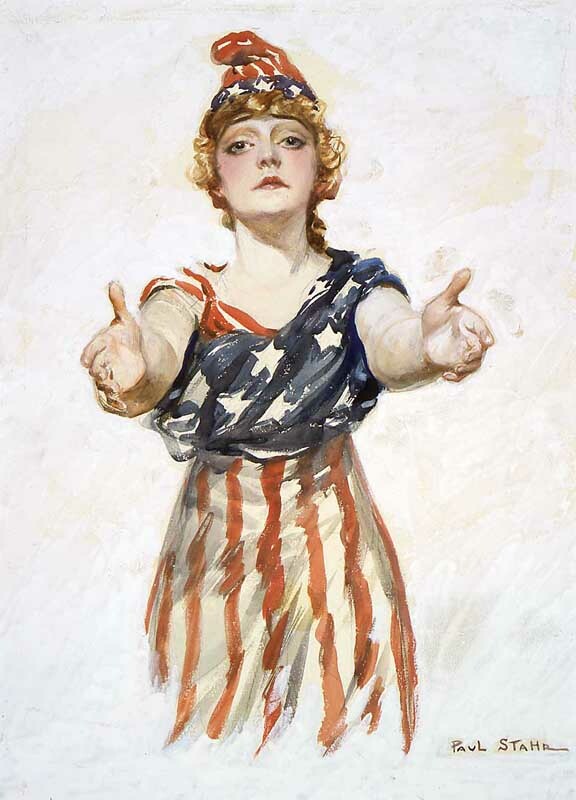 She is often depicted holding a glad, or with five pointed stars, or in the case of Lady Liberty in NY holding a torch as a beacon drawing people towards the Freedom she represents, the Freedom at the core of American idealism. Justice appears in several forms historically and our contemporary American Goddess of Justice, sometimes reduced to the idea of the anthropomorphic image of our court system, retains the classical imagery and is therefore essentially a contemporary manifestation of this ancient Goddess. While some suggest that the attributes of Lady Justice, the scales and sword, represent a combination of attributes of several goddesses we see these associated with the Roman Justitia and of the Greek Goddesses Themis and her daughter Dike. The Blindfold was an addition that began in the 15th century but still predates the modern depiction. Lady Justice is sometimes thought of as the moral power of our court system which is a little more esoteric and appropriate than simply anthropomorphizing our court system, but it still misses the mark on understanding the more cosmic force of Justice. Themis was a Titan who could see the past and future and her sword cut between fact and fiction giving a clarity of vision which allowed her to give true oracles. Themis has communion with the Fates and was associated with Divine Law and the customs which originated from the manifestation of the divine will. So her relationship to justice is essentially the institution of divinely inspired righteousness and the ability to discern and proclaim truth. A significant power that any magician should seek to be in touch with. Themis's daughter by Nomos, or Law, is Dike. To me this is an interesting idea, Justice proceeds from the joined application of Law and Righteousness, what is Customary should be what is Righteous, and the execution of restraint (legalism) is elevated by the righteousness of divine order. Justice isn't about our feelings, it's not about our sentiment, it's about what is right and good within the construct of social order. We often look at Justice as Blind because she is impartial, but impartiality implies that she is not sentimental or emotional. Dike, according to Hesiod, carried out the sentence or executed the final decision of the Fates regarding a person in order to accord their outcome to that which was moral and right. Lady Justice is a combination of these elements, and she has a series of attributes which we can examine to further explore her nature. Her depiction as a maiden is said to show innocence, and that innocence allows for her to be impartial and unbiased. Again, she is not colored by emotion or desire or sympathies or sentiment, as the maiden she has not gathered the ties and connections to be burdened by bias. This maidenhood allows her to be depicted without her blindfold and allows us to incorporate her vision into the past and future, when she is depicted with the blindfold it is likewise a symbol of this impartiality, and carries with it the implication that she is a blind or undirected force, and so when she is applied to a situation it is a natural and automatic act. She does not assess and make concessions, she simply executes her power to balance. She is depicted in Grecian attire, robed. This has been suggested to link her to Classical thought and a philosophical worldview. Even amongst the Romans the Greeks were thought of as symbolic of higher learning and philosophy. This therefore reflects that Justice is rational and accords with the higher minded impulses and the impulse towards the Public Good. The sword is a multifaceted symbol. It may retain the implication from Themis of cutting between fact and fiction, discerning what is true and what is false in an argument. It can also imply swift action and the idea of justice being quickly and directly administered. When can reflect the harshness of sentencing, but pointed downward can imply judgment tempered by mercy. With the two sided sword we also see the scales which balance each side of a situation and weigh the truth between them. In this idea we see the idea of two opposing parties, the accused and the accuser or the person seeking restitution and the person claimed to owe restitution. Justice is not necessarily always about two sides of a case, although in any case where we call upon justice I suppose it becomes that, our point of view versus that of the person we wish justice to act upon. But Justice may not way one story against another, it may way one story, or one person against Truth, or against what is right. In this reading of the symbol we might consider the scales of Ma'at. When looking at the scales as weighing between two parties, it may also be a matter of bringing about balance rather than looking simply at who is right and who is wrong. In the end, Justice balances the forces of a situation and applies law and order to remove those things which destroy that balance. She may also appear with a scroll. The scroll has been said to represent the law itself and the application of law. It also has been suggested that it represents knowledge and education and with Justice as a central element of the Public Good and the social ideal that she reminds society that education is a necessary component of that social Good. People have to seek to understand law and society and be knowledgeable about the social order. Another way to consider it is the relationship between Justice and the Fates. The scroll is the story, law itself can be described as a story or a mirror for the story of what ails mankind. We write laws to circumscribe those impulses, those fears, those acts into which we might fall which would undo society. Laws describe to us the problems we have encountered and anticipated and in a sense they tell us something about our history, our hopes, and our fears. The Fates likewise ordain our history, our experience, and what may come for us. The story which Justice holds is the story written on the loom of Fate. Justice may also appear holding a torch or the fasces. The torch is a symbol of the light of Truth or the ability to seek out Truth. I like to think of the torch again as a beacon calling people towards a life of Truth and Justice. The fasces are a symbol of authority, and in traditional Roman iconography represent the right of life and death, or the ability to pass sentence. When taken together, one in one hand, the other in the other, they represent the idea that authority will be exercised within the light of Truth, or the authority to institute a sentence or ruling based in the truth of whatever matter is at hand. From thee, Apollo's oracles arose, and from thy pow'r his inspiration flows. For holy honours to disclose is thine, with all the culture of the pow'rs divine. For thou art ever to the good inclin'd, and hostile to the men of evil mind. Wisdom, and virtue of whate'er degree, receive their proper bound alone in thee. It was common in the ancient world for a Nation or a People to have an ancestor who had some sort of divine origin. This element appeared in most Indo-European's mythologies. For Romans they had Romulus and Remus, who were sons of Mars. Romulus was later deified as Quirinus and was essentially the god of the virtues and ideals associated with Roman citizenship. We don't really have an equivalent element in US history. The various colonies have stories of their founding and we teach children the histories of those who founded our states. Often there are elements of these stories which explain trends or issues which make our state somewhat unique. This is not the same sort of thing though, at least not yet, maybe someday in the future this will take on some more legendary element. Another similar element in National identity was a Goddess who embodied the Nation just as their was a God who embodied the people. For Romans this was Roma. For Britian it is Britiannia, for Ireland it is Eriu. For the United States it is Columbia. Her name began to appear as an alternate name for the Americas in the 15 and 16 hundreds. She began to be personified in connection with the United States during the American Revolution, a slave named Phillis Wheatley wrote a poem dedicated to General Washington calling upon her, and she was the central figure of an early US National Anthem. She is associated with Lady Liberty but was a different figure. She has been used at times for various ideals and efforts that occupied American attentions. This is significant because she is a reflection of American idealism, American virtues, goals, vision, and identity and so she concerns herself with whatever concerns may affect the United States. As such her depiction changes over time as well. She usually appears in some sort of robe or dress, sometimes white and flowing, sometimes made from an American flag, other times simply recalling the colors of the flag. During World War one she appeared in a sharp Grecian dress in the pattern of the flag with a Phrygian style cap. Sometimes she has a crown like that of Lady Liberty. Early depictions included a laurel wreath or a feather bundle as a crown. In the 19th century Thomas Nast depicted her in several political cartoons as a defiant woman in a white dress defending minorities and protecting the rights of the marginalized. While not often recognized by modern people of the United States she appeared over and over through iconography and popular media of our Nation in various forms. Columbia is perhaps the most important and most difficult to understand in trying to approach the ideals of the Goddesses of America. She is the most far reaching because she is us, all of us, when we rise to the ideals of the American dream, and when we commit to the entrepreneurial, industrial, pioneering spirit which built America. She is a goddess who stands up for her citizenry regardless of social opinion. She is a goddess who supports Liberty, and Justice and calls for them to be part of her collective trinity of torch bearers guiding her Nation. But regardless of the specific issue at hand, unlike Justice or Liberty who are concerned with Justice and Liberty, she is concerned over all with the issues which face the Nation in a more sweeping and complete way. This, like the poem to Lady Liberty, might serve as an invocation or prayer to Columbia. It even feels like Thomas Taylor's renderings of the Orphic Hymns. It may need some modification since it is largely a prayer for Washington, but it could be used as a prayer in a working calling upon Columbia and Washington. There was also a song which was treated as our National Anthem unofficially until the 1930s according to one source. This one calls less directly to Columbia the Goddess as a personification of our Nation but more to the land of our Nation, which will be important for our next post. There are definitely elements of this one which would be useful in contact with some of the ancestral spirits of our nation which we discussed yesterday and therefore would work well in calling upon Columbia in conjunction with them. It would also serve well as a prayer or song to incorporate for the ideal of defending our Nation and for National solidarity even if not calling upon Columbia directly through its use. I hope you have enjoyed our discussion of American Goddesses, and yesterday's discussion of American Gods. If so, please stick around as we continue our look at the intersection of America, State Religion, and sorcery. Like or follow us to see more.